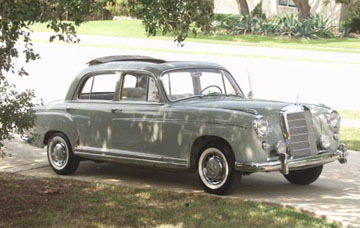 While driving my 1958 220S one evening, I heard a "click" sound from under the hood as I was at stopped at a traffic light. When I looked at my dashboard, the red generator light was illuminated. I tapped the accelerator with my foot and heard the click again, noticing that the generator light was now off. This happened a few more times on the way home. The next day when I started my car, the generator light remained illuminated and would not go out. I placed a volt meter on the generator to find that only one (1) volt was being produced. I called Onager Corporation (Bob Gunthorp) in Chula Vista, California to get a rebuilt generator. The Mercedes-Benz dealership priced the generator at $1,200! Bob's price was much better. As soon as the generator arrived, I eagerly took the old one off and replaced it with the rebuilt unit. To my dismay, when I started the car, the generator light was still on! I checked to make sure that I reattached the wires to the terminals properly. The wires were correct! This was a perfect time to evaluate the condition of the wiring harness. The wiring harness article was very helpful in this regard. 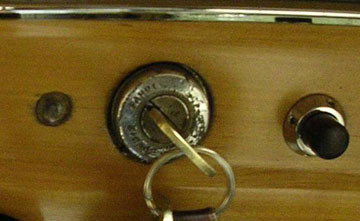 I made a copy of it to review "fender-side." Then, I was starting to think I may have a voltage regulator problem. 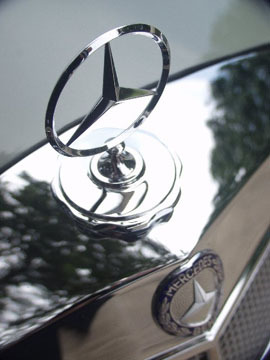 (Mercedes-Benz dealerships wanted $400 to $500 for this item!). I checked with Bob again, but he did not have any voltage regulators in stock. However, he did tell me about the need to polarize the generator. Polarizing a generator? I had never heard of this! Bob's instructions were to use a jumper from the battery to the generator by placing the negative (-) cable on the "DF" terminal, then from the positive (+) battery cable just touching the "D+" terminal just enough to create a spark. I gave this a try, but still ended up with the glowing generator light. I e-mailed Doug about trying to find a voltage regulator and how I had been trying to polarize my generator. He sent me an article he found on the internet after entering "Polarizing a Generator" into the Google search engine. It is nice to have the internet to find some of these obscure topics. 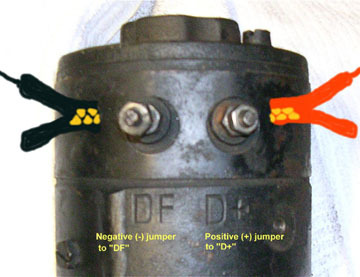 According to the article (http://www.netlink.net/mp/volks/htm/gen.htm) the positive (+) jumper needs to be in place long enough to make the generator spin. Warning: do this just long enough to make the generator spin as a lot of heat is generated if you keep the positive (+) cable in contact with the "D+" terminal. This can be accomplished before installing the generator or just before tightening the belt. I did it after loosening the belt as I had already installed the generator. After tightening the belt, I got in the car and started it. The generator light is no longer glowing. Bosch Service Bulletin "AB 322-2"
"Polarize your generator after you have installed and connected the regulator before you start-up the engine for further tests. Otherwise, you may have to contend with a generator whose basic polarity might have been reversed inadvertently. 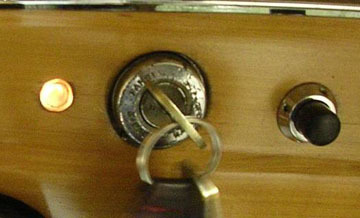 The consequences are: no output and a destroyed regulator. The proper method of polarizing the generator is to hold a jumper wire to terminal GEN (D +) and to briefly touch the BAT (51) terminal." Special thanks: to Bob Gunthorp and Doug Broome for their guidance in helping me get my car back on the road. I appreciate your kindness and consideration.